I believe we all have sacred spaces. At a park with family. A museum. A church. In your car listening to your favorite music. These are places, which as noted above, help us find and bring out our truest self. For me, I’ve made a sacred space I can go to at anytime. 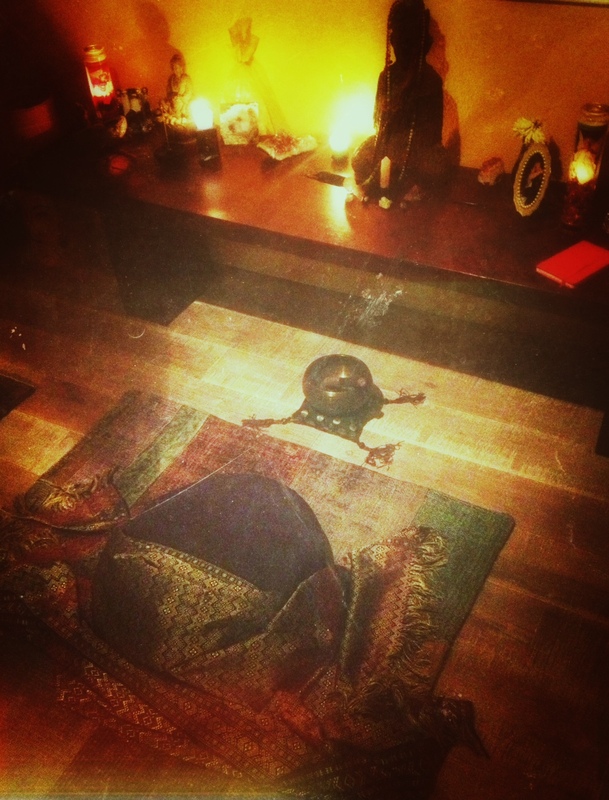 It’s my meditation room and altar. Meditation answers the questions my heart ‘s seeking answers to and makes me aware of the aspects and pieces of me that may need more focus or energy. 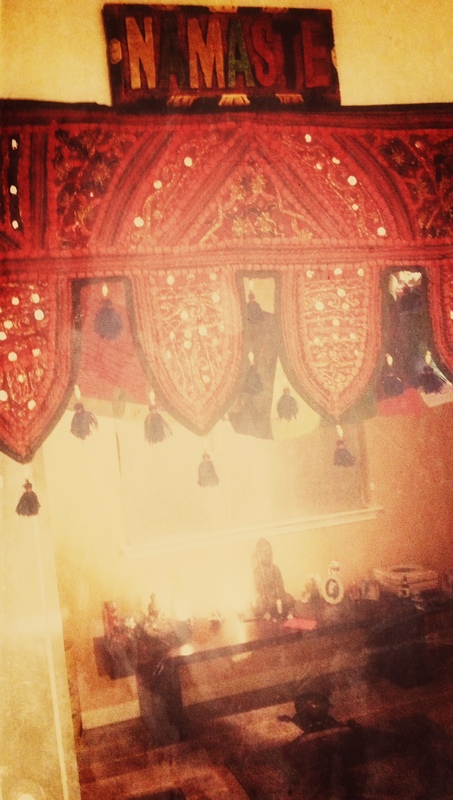 I wanted to share this sacred space for you and give you some quick and easy ideas on ways for you to find a space to reflect, grow, cry and challenge yourself to just be. You surely don’t need a whole room, as even a pillow, incense and a tea candle will more than suffice! Now let’s get down and dirty and do a “Cribs” tour of my favorite place! It looks like a lot when listed (and probably is bit much for some), but for me, it’s perfect….a literal soul collage. Photos of my loved ones who have passed on, who I also find as examples and pillars of strength in how they lived their lives. Malas (which are amazing concentration and meditation tools). I’ll be sharing a post on them soon! A fresh flower to bring in nature and is also great for opening the heart chakra (i.e. unconditional love and forgiveness). Incense (sandalwood and lavender are some of my favorites), along with a cast iron holder that makes it super easy to catch the ash and clean. Stones and crystals (everything on earth is made of energy, including “rocks”, these bad boys each hold a special meaning and healing property and help rid any bad juju….find one that’s right for you by clicking HERE). Candles, candles, candles! I’ve also recently found ones that include essential oils that help in realeasing certain emotions or create an ambiance of peace! LOVE! Buddha and Ganesha Statues – Buddhas are a symbol of peace, impermanence, and self-reflection. Who doesn’t love that? 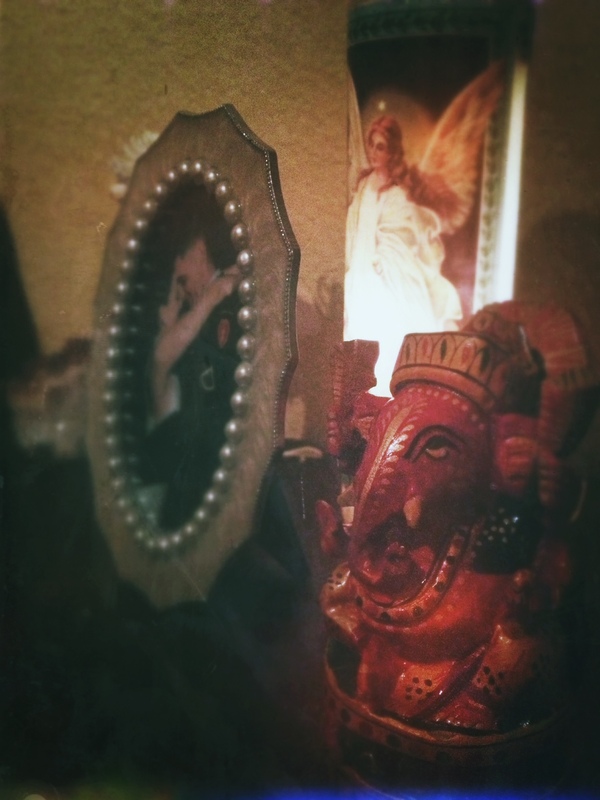 Ganesha/Ganesh is a Hindu god that represent wisdom and also helps in removing obstacles ( I also got this one on my trip to India and love remembering my time there by looking at it). A journal I use it to write thoughts, notes on that day’s meditation, intentions, quotes, etc. I personally love a Moleskine mini that I can just toss in my bag to take for visits to other sacred spots (parks, classes, and more). Zafus- These meditation cushions can literally change your whole meditation experience! They help in making the body as comfortable as possible, which is key when finding your meditation posture. ( I keep a couple of extras for when I have visitors come, too). I prefer Hugger Mugger Zafus. Blankets/Scarfs – They’re great to wrap around during a meditation! 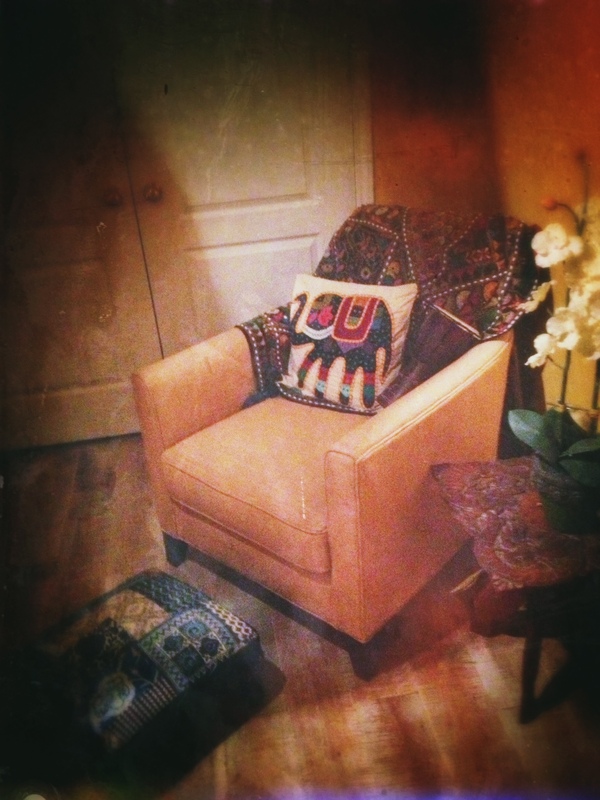 A comfy chair, footstool, Indian Blanket and drum! It’s a favorite spot to just sit and unwind! Aromatherapy Diffuser, just like this guy! LOVE IT and even have one for my car! 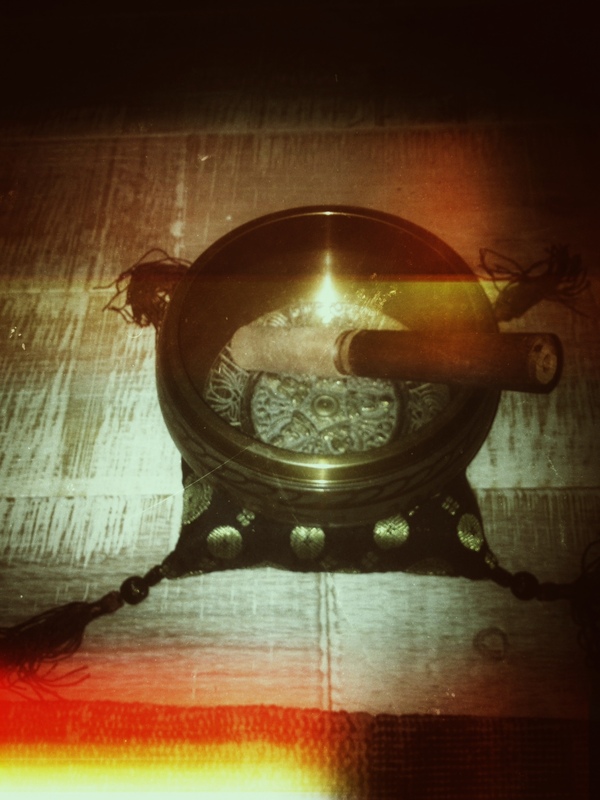 Tibetan Singing Bowl- I grabbed mine in India and use it before and after each sit down/meditation! I hope the links and photos give you somewhat of an idea. Challenge yourself to create or start to recognize your sacred places. Becoming aware of their power or the power that could be, is something you’ll never regret.